Beautiful Incentives: Get 3 Months of FREE Word Press hosting when you sign up now! Get 3 Months of FREE Word Press hosting when you sign up now! This is an AMAZING deal! Those of you looking for an excellent host, Wordpress hosting is IT. Ask any bigger blogger what they use and they will tell you Word Press Hosting. Right now until 8-19-13 you have the chance to get 3 full months FREE when you sign up! Sign up for an annual plan and get 3 free months of hosting! 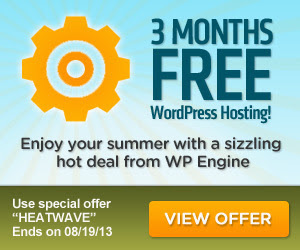 Just use the special code “HEATWAVE” when you sign up to claim your free hosting!